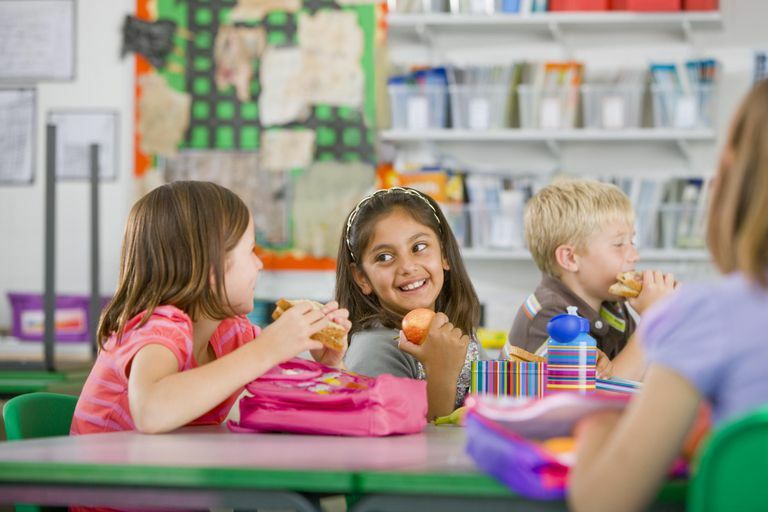 When it comes to packing school lunch boxes, it’s important to consider food safety, not just factors such as how to get kids to eat vegetables or whether or not it’s nutritious. Fact is, dangerous bacteria can rapidly build up in food that is not kept at a safe temperature. When you pack that lunch and send it off to your child in the morning, it can have unsafe amounts of bacteria by lunchtime. Get an insulated lunch box. According to FoodSafety.gov, using an insulated lunch box and frozen gel packs can be one of the most effective ways to keep food cold – and safe – till lunchtime. Anything that should be refrigerated, such as a sandwich made with lunch meats, yogurt, and milk, should be kept cold in your child’s lunch box. Pre-chill your child’s lunch. If you’re making a sandwich with deli meats or giving your child cooked chicken, pasta salads, or other pre-made food, try to make it the night before so that it chills adequately before you put it into your child’s lunch box. An extra benefit: Making lunch the night before is a terrific time-saver for busy mornings. Keep warm food warm. It’s just as important to keep hot food at a safe temperature as it is to keep cold food at lower temperatures. Bacteria can quickly multiply in food that’s between 40 degrees to 140 degrees – the so-called “danger zone.” To keep food hot, use a Thermos or a similar insulated food container. Before placing food in the insulated Thermos, fill the container with boiling water and let it stand for a few minutes. When the container is thoroughly pre-warmed, place the hot food inside and close the top immediately. Use at least two frozen cold packs. The U.S. Department of Agriculture (USDA) recommends using at least two colds packs to make sure that food stays at an adequately safe level of coldness in the lunch box. Put the most perishable foods right next to the ice pack. Some foods, such as crackers, bread, and whole vegetables and fruits (unpeeled bananas, apples, oranges, etc. ), don’t need to be kept cold. Put the foods that need to be kept cold right next to the ice packs so that they stay coldest. Use a frozen juice box. Another way you can keep your child’s lunch cold in her insulated lunch box is by freezing juice boxes. Pop them in the freezer the night before and voila! You have a cold pack for your child’s lunch that’ll thaw and be ready to drink by lunchtime. Throw away leftovers. If your child brings home an uneaten container of yogurt, a partially-eaten sandwich, or other food that she did not finish, throw it away. Any leftover food in her lunch box has been warm too long and is likely no longer safe to eat. The same goes for any warm food, which has most likely cooled to an unsafe temperature. Pack small portions. Young school-age children generally eat small portions of food. To avoid questions about what is and isn’t safe when it comes to leftovers, don’t pack large amounts of food in your child’s lunch. This will also save you from having to throw away a lot of food at the end of the school day. Do not re-use disposable packaging such as sandwich bags. Used disposable packaging could harbor bacteria and could cause illness. If you wanna go green with your child’s lunch box, opt for environmentally-friendly – but still safe – reusable lunch containers and packaging that can be washed and sanitized, such as reusable sandwich wrappers. Practice good hand washing habits. When preparing lunch, always make sure you wash your hands first. And teach your child to wash his hands properly before eating his lunch. Be cautious about cross-contamination. Wash cutting boards and counter surfaces and utensils thoroughly with hot water after preparing raw meat, poultry, and fish, which can harbor dangerous bacteria such as salmonella. If possible, consider using one cutting board for vegetables and fruits and a separate one for raw meat and poultry. Keep perishable foods refrigerated. Meat, poultry, fish, eggs and other perishable foods should be kept in the refrigerator at all times. Do not leave food at room temperature for more than two hours, or more than one hour if the temperature is above 90 degrees. Do not thaw frozen food at room temperature; instead, thaw it overnight in the refrigerator.